So as you know from my last post, I'm moving back to New York in a few weeks. I'll regretfully not be there in time for Full Figured Fashion Week, but I encourage all of you to check it out. More exposure and positive press means more ability to make brands like mine a reality! I'm furiously trying to make sure I don't leave anyone in the lurch information-wise while I transition, so here's another teaser from the line. This time, we have FLAMINIA. This dress is inspired by James Galanos and Hana Mori, two designers famous for making women look chic in the 1960's - 1980's. Galanos was Nancy Reagan's favorite designer, and wore one of his designs for the 1980 inauguration. Chic! 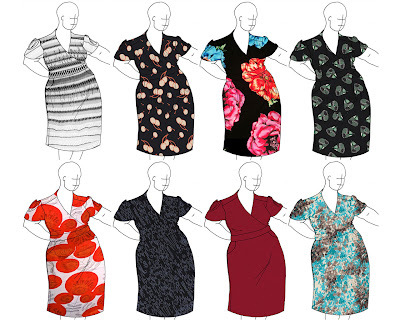 FLAMINIA has a surplice (cross front) bodice, so many bust shapes can be accommodated, inverted tulip short sleeves, adding a pretty, feminine detail, a relatively straight/ pencil skirt, and a wide shaped waistband. Oh, and of course...pockets, so you can be chic and practical at the same time. Perfect dress for a spring or summer day at the office! I hope to have some more big news very soon, so hold tight, loyal followers.